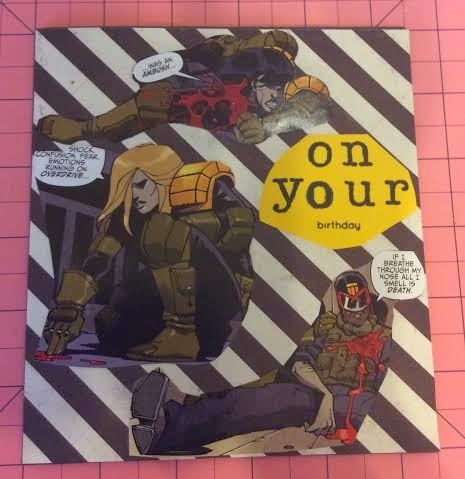 Today I've got a birthday card with a book theme and a funny (hopefully) birthday card with comic book cutouts. I love the basicgrey 6x6 Aurora paper pack so much that I bought a second one and the coordinating basicgrey Aurora Mini Library Pockets. I really like this set of five, but if you're interested, you might want to know that only two of pockets actually look like library pockets, in my opinion, and neither of those two have the standard library insert check out card. 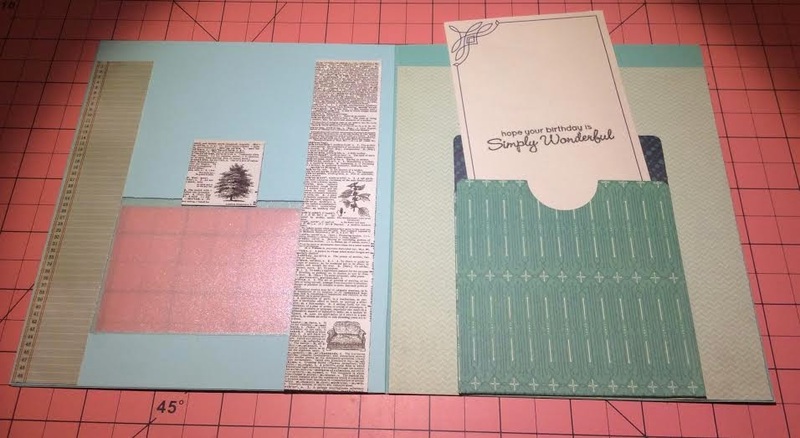 One has a decorative note pad look (see the inside of the first card below), and the other has a "to do list" that means to emulate a library insert check out card. Both of these are actual library pocket size which I didn't expect based on the mini branding. Two of the remaining pockets look like gift card holders. One has an insert with a decorative border and the other has an insert with the heading "notes from today." There is a also a pocket that looks like a tabbed folder. Its insert also looks like a sheet with a decorative border. So, not exactly what I thought it would be, but I do recommend. I also bought the coordinating basicgrey Aurora Die Cuts and Transparencies. I haven't used these yet, but they are a wonderful addition if you love the paper pack as much as I do. Some of the transparencies look like they would make great mini windows. 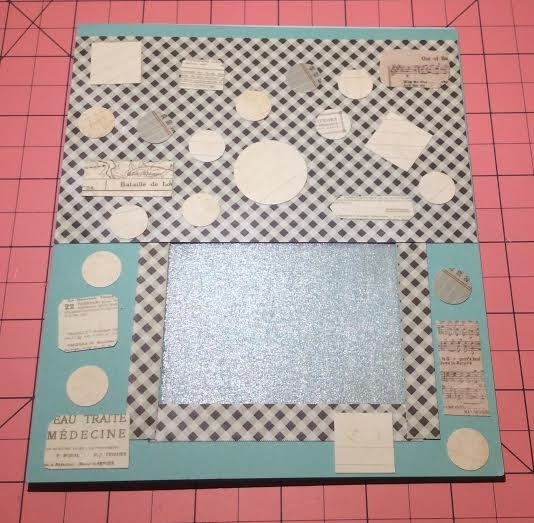 For these projects I also used Pebbles' 6x6 Front Porch, Authentique's 6x6 Classique: Beauty, Crate Paper's 6x6 Farmhouse, Crate Paper's 6x6 DIY Shop, Echo Park's 6x6 Getaway, and other assorted papers. But, perhaps the really exciting bit for me as a card crafter is that I used stamps for the first time. I was trying to avoid that rabbit hole, but Simon Says Stamp sent me a free gift that included stamps! I didn't think I would like a stamp set so much, but I really love this one. It is the Polka Dot Greetings set from Die-namics and arrived with a coordinating die (too bad I'm not ready to buy a die cut machine). Unfortunately, I think they send out of stock or discontinued products as free gifts. 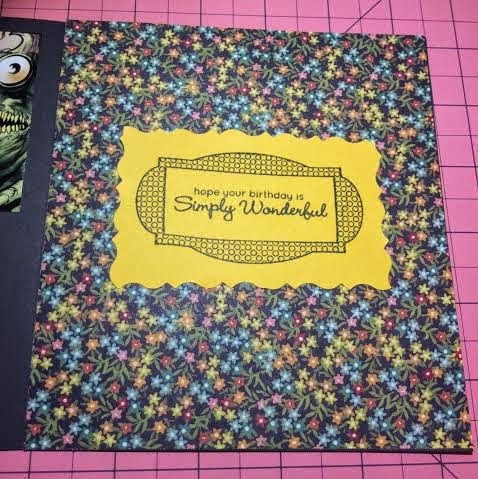 Nonetheless, this stamp set is great because the sentiments are versatile, and there are three frame stamps that can be interchanged or not used at all. I was especially pleased with myself for successfully masking out all but one word on the birthday stamp on my first time out on the second card below. I guess I've watched that many craft videos!